On April 20, 2017, a Presidential Decree PD-2909 “On measures for further development of the higher education system” was signed by the President of the Republic of Uzbekistan Sh.M.Mirziyoev. The department of quality control of educational activities is guided by the Decree of the State Inspectorate for Supervision of Quality of Education of the Cabinet of Ministers of the Republic of Uzbekistan № 50 dated December 30, 2017 ” approved by the Order of the Ministry of Higher and Secondary Special Education of December 26, 2017 № 941 ” Ministry of Higher and Secondary Special Education on the basis of “Network Tariff Qualification Information”. In order to fulfill the tasks outlined in the current decree and to achieve effectiveness in the system of higher education, on July 18,2017 The Cabinet of Ministers of the Republic of Uzbekistan adopted the decree №515 “On the organization of the State Inspectorate for supervision of the quality of Education under the Cabinet of Ministers of the Republic of Uzbekistan” and on the basis of controlling center for the quality of training professions, Department of Certification of teachers and educational institutions of the State Testing Centre, the State Inspectorate for Supervision of the quality of Education under the Cabinet of Ministers of the Republic of Uzbekistan was organized. On the basis of these normative and legal acts, the Education Quality Control divisions started to work in all higher education institutions of the Republic of Uzbekistan in December 2017. On December 28, 2017, a department for the quality control of education at the Karakalpak State University was established and started its activities. 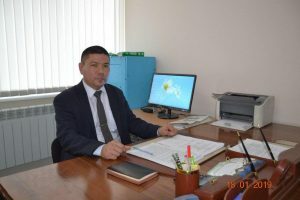 Duysenbaev Olimjon Ismailovich was appointed as the head of this department at the recommendation of the State Inspectorate for Supervision of Quality of Education under the Cabinet of Ministers of the Republic of Uzbekistan. Starting from December 2018 Eshmuratov Shavkat Artykbaevich is the head of the department. Ganiev Salamat Tursinbaevich and Pakhratdinov Sultan Yunisovich have been appointed chief specialists of the department in accordance with item 14 of the Decree of the Cabinet of Ministers of the Republic of Uzbekistan dated July 18, 2017, № 515. The department of quality control conducts its activity on the basis of the Standard Regulations “On the quality control of education in the higher educational institutions of the Republic” approved by the Order of the State Inspectorate for Supervision of the quality of education at the Cabinet of Ministers of the Republic of Uzbekistan and by the approved plan of action and by the order of the Ministry of Higher and Secondary Special Education of December 26, 2017 № 941, “The Ministry of Higher and Secondary Special Education” Network Tariff Qualification Information ” dated December 30, 2017. The main goal of our department is to study the compliance of the students’ knowledge of the state educational standards with the state educational standards, to analyze the quality of the cadres and organize the internal certification of the university, as well as information on the results of internal certification, factors affecting the quality of education, to provide the information to the university rector and the State Inspectorate.